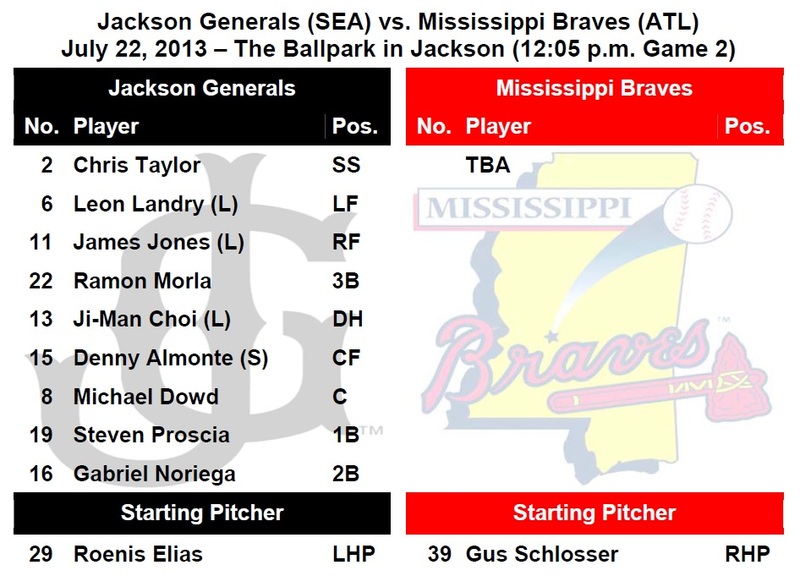 TODAY’S GAME: the Generals conclude their 10-game homestand (2-6) today with a doubleheader to close the series with the Mississippi Braves at The Ballpark in Jackson…this is the M-Braves’ first and only visit to Jackson this season. 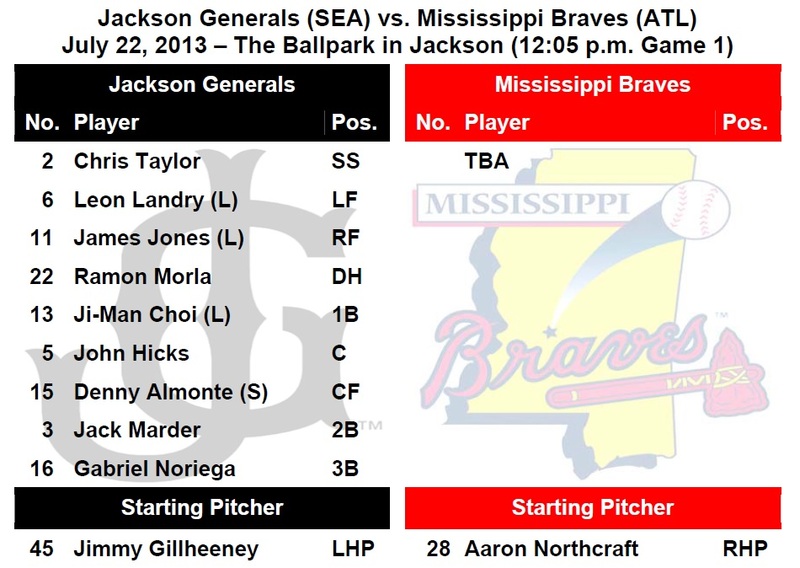 The Braves lead the season series 5-3 while Jackson leads the all-time series 84-83…25-year-old LHP James Gillheeney starts game 1 of the DH while ….This is his 4th career start vs. MIS and is 0-3 with a 8.84 ERA in those games in 2010, 2011 and 2012… 24-year-old LHP Roenis Elias makes his 18th start for the Generals in game 2. Elias is 1-6 with a 3.93 ERA at home as opposed to 4-2 with a 1.78 ERA on the road. DID YOU KNOW? : that the Generals have been postponed 13 times and had 2 games suspended due to rain this season. The Generals lead the league in doubleheader games having played 16 coming into today. The M-Braves have been rained out only once this season and are 2-0 in doubleheader games. GENERALS RECAP: After waiting through a 56 minute rain delay, Sunday’s game between the Generals and Braves was postponed due to rain. 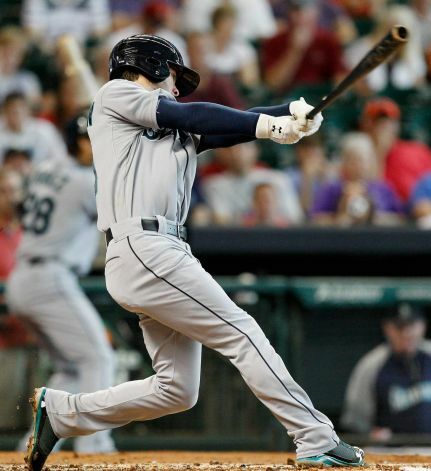 • ALUMNI REPORT: Seattle 2B Nick Franklin hit a grand slam HR for the Mariners in Houston during the 12-5 Seattle win. Franklin’s 7 home runs are tied for 2nd-most among American League rookies behind Aaron Hicks’ 8 for the Twins. M’s SS Brad Miller added 2 hits and 2 RBIs as the 2 rookies atop the Mariners order combined to go 4-for-11 with 6 RBIs on Sunday.